Ballyhale's Henry Shefflin celebrates with the cup. KILKENNY GAA LEGEND Henry Shefflin has confirmed he will decide whether or not to retire “within the next week”. “Ah sure look we’ll be all glad when it’s all over and the decision is made. I’m fed up with ye asking and ye are probably fed up with me putting it off. “At least we have come to a final and this is it now. I’m going to enjoy the celebrations for a day or two and then this weekend I am going to reflect on it and make my decision then within the next week. 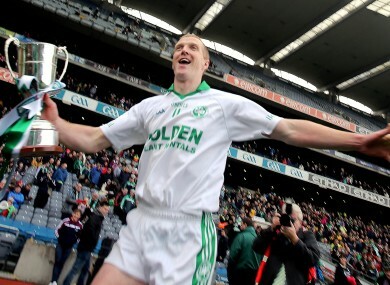 Shefflin also admitted that helping Ballyhale Shamrocks win the All-Ireland senior club hurling championship for a record sixth time would represent a fitting conclusion to his career. “It’s the perfect platform; to win an All-Ireland, a third with your club, but then you’re saying to yourself that it’s the end of March so the season is nearly over — it’s really rocking on. It’s a decision I need to be in the full of my health. “There’s no club championship to worry about, though it’s starting up in Kilkenny in a couple of weeks time, which is crazy. He also denied suspicions that he had already privately decided on his future. “To be fair, I’ve been very balanced. There are occasions when one of the lads goes and you say to yourself ‘will I go?’. Then you watch a match and you say ‘will I stay?’. “I said I was going to see how I was, see how my body was and I’m very comfortable in that decision. People ask was today a factor, but it wasn’t. And this latest success means Shefflin now has an incredible 13 All-Ireland senior medals to his name in total. “It’s brilliant. I grew up in a pub in Ballyhale and the first team in ’91 were just finishing their third All-Ireland. I suppose it was an unbelievable achievement — I didn’t realise at that time how hard it is, so for ourselves to come along and achieve that feat as well is absolutely brilliant. Email “Henry Shefflin to make decision on retirement 'within the next week'”. Feedback on “Henry Shefflin to make decision on retirement 'within the next week'”.